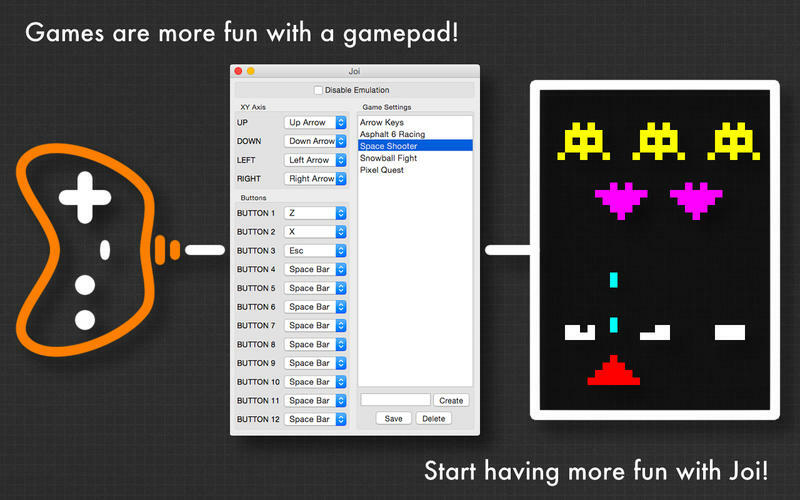 Joi enables you to play games that do not have gamepad or joystick support. Such as online games or even desktop games. Just plug-in your gamepad/joystick via usb and then start Joi. It's as easy as mapping the keyboard keys that are supported by the game to the axis and buttons of your device, then saving the game setting. It can even run behind fullscreen games! 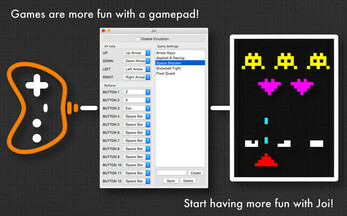 Joi supports usb gamepads/joysticks that are supported by Mac OS X. Other gamepads/joysticks may work but are not officially supported. Joi does not support mouse emulation. A Windows version will be available at a later time. Want to make sure your gamepad/joystick works with Joi before purchasing? Then get "Joi GamePad Test" file!